This video walks you through how to set up a full web stack with XAMPP on Ubuntu Linux. Instead of manually setting up your web environment piece by piece, a stack installer like XAMPP can save you a lot of time and headache. From here, we'll move on to set up a turn-key Drupal site with another compatible tool called Bitnami. If you need to set up a web environment for Linux this is the video series for you. If you need to set it up in Windows or Mac go ahead and watch the previous videos instead. 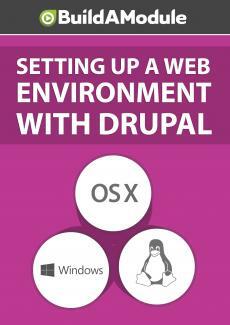 Setting up an environment in Linux is a little bit more involved because there's not an application quite like Dev Desktop that will install the full web environment plus Drupal and take care of all of the configuration for you. That said, we can get pretty close with something called XAMPP and Bitnami. So what we'll do first is set up a stack installer called XAMPP and then we'll layer a Bitnami module on top of that to install a Drupal installation, and then because Bitnami only allows you to have one Drupal installation at a time we're going to explore how to create additional websites using XAMPP. And that will expose you to some of what's happening behind the scenes when you use full stack installers like Dev Desktop. So what I'm going to do is do a search for download XAMPP. And I'll click on this first link, which is Apache Friends dot org slash download dot HTML. And we're going to scroll down to the Linux section down here, and there are three different additions depending on which version of PHP you need. We're going to go ahead and download the 5. 6 one. And I'm going to download it for 64 bit. I'll click okay to save the file. Once it's downloaded I'm going to navigate to the directory where it was downloaded, and in order to run this we're going to need to change the file permissions. So I'm going to open up a terminal screen. To change permissions I need to be a super user. So I'm going to type in pseudo dash I and enter my password. And then to change the permissions I'm going to use the change mod command, CHMOD. I'm going to change it to 755, I'm going to add a space, and then I'm going to drag this file name over and hit enter. And now to run the file we're just going to drag it over to the command line, and hit enter. This will open up the setup for XAMPP. I'm going to click next, we'll leave both of these checked and click next. We'll click next again. I'm going to uncheck this so it doesn't open a browser window, and I'll click next. Next one more time. We'll leave launch XAMPP checked and click finish. And here we are right now in the manager. The manager is useful to get around but it's not absolutely necessary. If you click go to application it will take you to local host slash dashboard. And you can get back here at any time by simply going to local host. From here you can access any applications that have been installed through Bitnami. We'll install Drupal that way in a moment, and you can get to PHP my admin, which is the database manager. I'm going to jump back over to the manager.